This decorated lift is located in the East Village shopping centre, in the inner city suburb of Zetland. 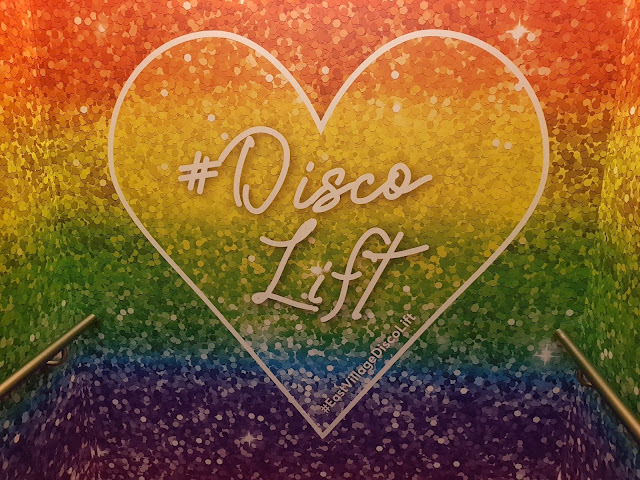 The interior has been transformed into a "Disco Lift" with sparkly rainbow theme decorations, disco lights and music for the annual Sydney Mardi Gras. Tonight is the 41st annual Sydney Mardi Gras parade. ha, I'd like to see that. sweet memories. Okay... I didn't know disco was still cool! It sure lift your spirit. Nice. Happy Mardi Gras week, jim! Is Disco mkaing a come back? Fun! I don't know. Up close and personal, that just might create a little sensory overload when you add lights and music. It's actually tastefully done and only one of three lifts was done up. It was funny seeing the kids getting really excited to see the decorated one when the doors opened, as if they hit the jackpot. Looks like the right place to be during Mardi Gras!